The team behind GoThereFor.com longs to see the fruit of the great commission in our lives and churches; we want to see Christ’s disciples growing in godliness and maturity so that they go out with urgent love to the communities and peoples around them to make new disciples and to teach them to obey all that Christ has commanded (see our full Ministry Manifesto). Ideas: a regular stream of posts, essays, interviews, video and other content, including the online Briefing archive (free for anyone to browse). Resources: easy unlimited access to a huge range of disciple-making resources. Most of these are available for download (for paid members); some are only available for purchase (via our partner organization, Matthias Media). At the heart of GoThereFor.com is a constantly growing online library of digital ministry resources that members can download, print, copy, email and generally make the most of within their own ministries. Here’s how it works, and why you should consider signing up. Members of GoThereFor.com will also get exclusive access to special offers throughout the year. GoThereFor.com represents a new model for delivering high-quality ministry resources to where they are needed—on the ground, in local churches and student groups and small Bible study groups all over the world. It’s basically a partnership. On your side, you pay us a modest membership fee each year (or each month) so we can cover our costs and maintain and grow the online library; you can pray for the many ministries who are part of GoThereFor.com. For our part, we’ll keep working to provide you with ideas and stimulation for ministry, as well as easy unlimited access to the world’s best library of evangelical ministry resources. The more people who join GoThereFor.com, the more we can do to improve it—for example, in providing foreign language versions of as many of the resources as possible. See our plans and pricing page for all the details. We hope you agree that it represents phenomenal value for money. GoThereFor.com is a project of Matthias Media, an international evangelical publishing ministry based in Sydney, Australia. (For more information about Matthias Media, our history, our people, and our mission, go here.) Naturally enough, this means that many of the resources on GoThereFor.com are the Matthias Media resources that have become so well-known, used and trusted around the world over the past 25 years. However, one of the exciting benefits of this new platform is the opportunity it provides for us to link up with other evangelical ministries and organizations to feature their resources as well—such as the new edition of the Introducing God evangelistic course, by Dominic Steele and the team at Christians in the Media, or the preaching workshops from the Charles Simeon Trust. We’re looking forward to gathering as many excellent resources as we can at GoThereFor.com from churches and ministry organizations around the world. We guarantee that everything on our site is high quality, biblically faithful, and useful for disciple-making ministry. 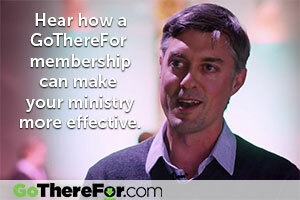 We want GoThereFor.com to become the world’s most trusted and useful online home for disciple-making ideas and resources. Go here for all the details about the membership options available, and how to become a member. To comprehensively explain the mission and vision of this platform, we’ve written it down. For the ‘Ten Commandments’ that make up the GoThereFor conditions of use, and all our other policies, head over to ‘Conditions and policies’. The directors sitting on the board for St Matthias Press are Ian Carmichael, Andrew Grant, Chris Makin, Jonathan Marquet, Tony Payne, Andy Pearce and Andy Simpkin.